Maintaining a Toyota Tacoma or Tundra requires regular routine maintenance. These services are designed to keep you behind the wheel of your truck longer. This article applies to the Toyota Tacoma and Tundra (1996-2015). The Toyota Tacoma and Tundra are both exceptional trucks with incredible towing and utility capacity. Highly rated among consumers and well tested by research organizations for safety, both the Toyota Tacoma and the Tundra offer reliability, performance and longevity. To keep either truck running the longest, you'll need to follow your maintenance schedule to the letter, and be on the lookout for common problems that could lead to bigger system failures if left unchecked and unresolved. Here's what you need to know! A regular maintenance package should run you around $500 at a local Toyota dealership. Figure 1. Change your distributor cap. 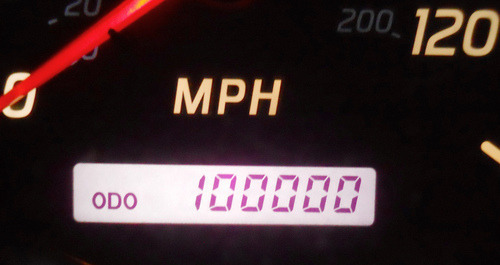 Once you start inching toward the 100,000- to 120,000-mile marker, it's important that you change your engine oil and filter, as well as replace all other bad/low fluids, rotate your tires, and have a full inspection of your undercarriage, brakes, as well as exterior lights. Pop the hood and check all your hoses and belts for wear and tear. You'll also need to replace your spark plugs and wires, service your battery, inspect your timing belt, adjust your valves, replace your fuel filters, as well as clean your throttle body and brakes. At this time, you'll also want to have your safety system restraint checked and your engine fully inspected. Drain and refill your differential, transmission and transfer case fluids, flush your cooling system and inspect all ball joint covers and drive axle boots. The above-mentioned services should be carried out by a licensed professional, as many need to be performed in carefully-timed intervals. Figure 2. The Toyota Tacoma and Tundra are both built to last. What are some common causes of a drop in gas mileage in either truck? Gas mileage can decrease for a number of reasons. In particular, you may need to replace your oxygen sensors and air filters, update your spark plugs and wires, which, as a rule, should be done every 30,000 miles, and change out any bad fuel injectors, which may contain leaks. Persistent idling can also cause a decrease in mileage. Maintain your regular maintenance schedule and you should see an improvement. Any towing issues for the Tundra 4.7L V8? When it comes to towing, the Tundra 4.7L V8 sticks pretty close to its manufacturer recommended tow rating, which should not be exceeded. (Check your owner's manual for your truck's specifications.) The 2003-2006 Tundra 4.7L V8 offers a towing capacity of 6,500 pounds, which is comparable to the 2005 Tacoma. Also consider tow distance when deciding if your truck is capable of hauling the poundage (load capacity) you require. You'll want to replace your timing belt every 90,000 miles. Going too far beyond this recommended interval could lead to permanent damage to the timing cover and chain contacts. Replacement kits are available online, as well as through local auto parts stores. Keep in mind, however, this is a big job that might be best left to the pros! It's time to change your water pump when you notice signs of a leak when your truck is parked, whether clear in color or green (anti-freeze). A loose pulley or bad bearings may also be the culprit. If your thermostat warning light or low coolant light displays on your dashboard, make the necessary replacements.